A friend recently gave me a copy of Steve Brown’s book A Scandalous Freedom. The Radical Nature of the Gospel. Maybe he thought my life was confined by too many ‘don’ts’ and wanted me to discover afresh the gift of freedom in Christ. Brown’s thesis is quite basic — Christians in North America have lost the true sense of Gospel freedom that they possess. Instead, Christianity has become another religious system, using rules and other pressures to provoke its followers to moral living and good deeds. In succombing to this less than Gospel understanding of Jesus’ message, believers remain "afraid, guilty and bound." Legalism, wrong teaching, abusive leadership, false expectations all conspire to rob believers of their freedom. "There is so much more to being a Christian than obeying rules, doing religious things, and being ‘nice’." With considerable wit, insight into ‘churchianity’, personal transparency, pastoral care, and theological acuity, Brown challenges us to be free. His goal is to help Christians recapture true Christian freedom and become the potent Kingdom force that God intended them to be, living with joy, courage, and peace. They will know God’s love, God’s grace, and God’s forgiveness and it is deeply liberating. Brown’s objective is admirable and in many instances needed. It is important to grasp and build into our lives the wonderful liberty that Jesus has purchased for us. Conversely, we have to reject pretense, tradition for the sake of tradition, the paralysis generated by fear, and attempts by some Christians to control. However, I have my reservations about Brown’s presentation. 1. Paul revels in the freedom Jesus provides from sin’s power and the burden of generating our own righteousness. Brown rightly emphasizes this. In Galatians 3 to 5 Paul describes the astonishing transformation — believers are no longer under the power of the Law, the curse of sin, the weak and beggarly cosmic powers. But just as much as he celebrates this significant liberation, he emphasizes that God’s invitation to live in his freedom means "walking in the Spirit," "keeping in step with the Spirit," and recognizing that "I no longer live, but Messiah lives in me." The freedom we have in Christ is not autonomy; it is a freedom to be one of the Messiah’s "Kingdom of Priests", the Messiah who is our Lord. As Paul says in Romans 6:22 that we "have been set free from sin and have become slaves to God." I did not perceive this side of the biblical freedom equation in Brown’s presentation. 2. Paul also emphasizes that our freedom is exercised in the context of Christian community. Brown places significant emphasis on the believer as individual, but does not seem to balance this with the biblical reality of believer as part of the body of Christ. As a believer I am not free to be me without restraint. The three great commandments — love God, love neighbour, and make disciples — sets each believer in a new relational network that shapes the nature of Christian freedom. God has not purchased through the Cross my freedom so that I can sin and harm Christ’s body, bring disrepute to the Gospel, and advance Satan’s cause. Of course, Christians sin and God still loves us. In his extensive discussion on the boundaries of Christian freedom, Paul concludes "Everything is permissible—but not everything is beneficial. Everything is permissible — but not everything is constructive. Nobody should seek his own good, but the good of others" (1 Corinthians 10:23-24). For Paul the best way is the way of love and this gets worked out in the community of faith primarily. Jesus warned us about causing one disciple to sin. For him this was an important issue. 3. Christians are to be and do good. Whether you read 1 Peter or Titus (or the Sermon on the Mount), one of the outcomes of Kingdom living is goodness — expressed in our being and our actions. We do not manufacture this ourselves, but are dependent upon the Holy Spirit for its production (note the imagery Paul used about the "fruit of the Spirit"). However, we also have responsibility, as Jesus put it, "to seek first the Kingdom and its righteousness" (Matthew 6:33). Peter said that Jesus sacrificed himself "so that having died to sins we might live for righteousness" (1 Peter 2:24). Brown is right to point out that this should result in a "holier than thou" attitude or a self-righteous, judgmental spirit. Doing good flows out of the love the Spirit gives us for others. Being good arises from the Spirit’s consist guidance and empowerment to resist evil. There is both spiritual freedom and spiritual discipline in Christ. While believers no longer live under the authority of the law’s tutelage, they are indeed "slaves of Christ." As a Christian I am born again into God’s family, but He is the Father and as Peter reminds us the "one who judges with impartiality." Peter urges us "as obedient children…to be holy in all that you do"
More could be said, but space does not allow it. By all means read Brown’s book. However, I do not think his presentation provides an adequate, nuanced biblical understanding of our freedom in Christ"(1 Peter 1:14). One of the secret skills employed by just about every minister I know is the ability to scribble. For years I thought that I was the only one who had doodled my way through more conversations than I can remember. All I need is a booth in a restaurant, a napkin and pen, an interesting conversation and the magic begins. Some have said that virtually all artwork begins as a scribble [which may be why people keep finding pieces of art from Picasso or Rembrandt to sell at auction.] My guess is that there is an equal body of ministry that began with a squiggle. Over the years, I’ve drawn pictures to communicate everything from the message of the Gospel to the structure of ministry relationships. In each case, it has been proof that a picture is worth a thousand words. And, over the years I’ve discovered that I am not alone. Almost every pastor I’ve met has their own portfolio of profound doodles. So, you can imagine my joy when I discovered the book by Dan Roam, The Back of the Napkin [Penguin, New York: 2008.] There has been a lot of pressure over the last few years for Pastors to elevate their quality of presentation. It’s a way of catching up with the advancement of technical, automated multi-media which has created a demand for what one writer calls: "multi-dimensional, geospatially-grounded visualizations with time lines and cross-cutting cultural dimensions." And, that’s just what’s expected from Power Point! As I opened The Back of the Napkin, I was thrilled to find that Dan Roam had made the simple science of the scribble an art form. With simple exercises, he makes it easy for even the most inept to draw a picture that would – as advertised by the subtitle: solve problems and sell ideas. As I’ve been working through the exercises, it’s hit me – it’s going to change the way I make presentations at large, and that’s a good thing! Interested? You can check it out for yourself: www.digitalroam.com – or – www.thebackofthenapkin.com. This entry was posted in Book Reviews and tagged Cross, Gospel, Ministry on January 30, 2009 by Lyle Schrag D.Min.. In Pakistan there is a strong tradition of "holy men" who are called Pirs. One day I had a visit from a young man who informed me that he was the Pir of his village. I was puzzled by this because he was dressed in modern clothes and did not have the religious, spiritual air one would expect from a revered holy man. He explained that in the tradition of his tribe, the honor and authority of the Pir was passed on from father to son and his father had recently passed away. For his part, he did not believe that he was able to give blessings to people, nor that his prayers were especially efficacious. In fact, when his father died and the mantle was passed on to him, he tried to refuse it. He told the people that he didn’t believe and that he didn’t want the responsibility. They replied, "It does not matter what you believe. You are the one chosen for this position and no other." Pakistan is a High Power Distance culture (HPD). It is the role and status of the leader, rather than his or her particular character or ability that is of greatest concern. In this context a high priority is given to maintaining harmonious relationships and affirming the historical traditions and social structures. Rules of conduct are paramount, and anyone who does not function within that protocol is ostracized, no matter how reasonable or beneficial their proposals might be. In HPD cultures, it is assumed that the status quo is the way life is intended to be; the established hierarchy is ordained, competition is bad, and conformity to tradition and roles is good. Canada, on the other hand, is a Low Power Distance culture (LPD). Titles and status mean little if the person in charge cannot fulfill their responsibilities. Harmonious relationships may be sacrificed in order to pursue a particular goal and the measurement of success is accomplishment. In LPD cultures, it is assumed that reversal of fortunes is a part of life, competition is good and no one has ordained or fated priority. When I was doing my master’s thesis on Chronological Bible Storying among the Sindhi people on the story of the washing of the disciples’ feet (John 13), one aspect that the Sindhis who were interviewed emphasized over and over again was the importance of the disciple to always obey the teacher. They were appalled at Peter’s audacity when he refused to let Jesus wash his feet, and they found Jesus’ stern response, "You will not have any part of me," to be necessary and appropriate. HPD cultures, like Pakistan, consider the student insubordinate and rude who would question or contradict a teacher. Rote learning is the preferred method of learning as it emphasizes the teacher’s status above the student. In contrast, a teacher in a LPD culture like Canada encourages the student to challenge and question. Ideas and the stimulation of the mind are of first importance. Due to Power Distance, leadership within a LPD context will function differently than within HPD groups. Awareness of this dynamic in interpersonal relationships along with appropriate adjustments can greatly reduce tension in multicultural churches. In the book UnChristian (Grand Rapids: Baker, 2007), which deals with research from the Barna group, David Kinnaman refers to a survey which asked the participants to agree or disagree with the statement, “Christian churches accept and love people unconditionally, regardless of how people look or what they do” (p. 185). 20% of non church goers (outsiders) agreed strongly, just over 40 % of church goers agreed strongly, but 76% of pastors strongly agreed that this statement described Christian churches. The discrepancy is intriguing. Do the pastors have a good sense of reality based on personal experience, or is this an expression of their desire for this statement to be true? Have the outsiders been biased by unfair reports, or have they had negative experiences that contradict the statement? I suspect that part of the discrepancy has to do with the difference between standing inside looking out verses standing outside and looking in. For example, I have a love / hate relationship with hospitals. I think they are wonderful but I am happiest if I don’t have to be inside one. When visiting I feel quite out of place and uncertain about what I am permitted to do and am always relieved to leave. On the other hand, my daughter, Becky, has just completed her nurse’s training. She enjoys the environment, loves to be busy and experiences significance as she helps the patients. The hospital is the same, it is our separate and distinct relationships with and experience of the hospital that is different. It is a matter of perspective. This illustration may parallel the contrasting perspectives between pastors and the outsiders described by Kinnaman. What looks like love to the pastors is seen through another lens by the outsiders and experienced as uncomfortable, judgmental or cold. Most likely the relationships and environment of church speak differently to outsiders. Perhaps their language of love is different from what is normally expressed in church. If this is so, then those of us who are church goers need to learn to speak another language of love, one that is understood by those outside of the church. This missional stance – becoming like others, as opposed to inviting others to become like us – has even greater urgency when relating cross-culturally. What is considered comfortable, familiar and accepting varies from culture to culture. Cross-cultural experiences tend to be stressful due to the many unfamiliar cues which bombard the person who is not used to the setting, cues that need to be interpreted. In that context even expressions intended to communicate love and acceptance can be misunderstood or judged negatively. 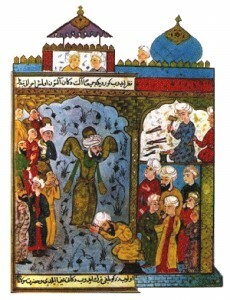 On the other hand, when God’s people learn how to make people from another culture feel comfortable and accepted by speaking that people group’s language of love, rather than waiting for others to conform to the church’s way of relating, then the experience of the outsider will correspond to the perspective of the insider. This entry was posted in Church, Culture and tagged Church, Cross, Culture, God, Seminary on April 4, 2008 by Mark. There is no real danger lest Jesus be lost among the many in all this, that it may end up in his being put in the Pantheon of Hinduism. Greece and Rome tried that and the pantheons amid which he was placed are gone – Jesus lives on. He is dynamic, disruptive, explosive like the soft tiny rootlets that rend the monuments of man’s pride. Like the rootlets he quietly and unobtrusively goes down into the crannies of men’s thinking, and lo, old forms and customs are broken up. Absorb him? You may as well talk about the moist earth in springtime absorbing the seed! The seed absorbs it, for it is life. Jesus is Life. He will take care of himself. During my trip to Pakistan for Bible translation at the end of 2007, I was involved with a small team of translators and helpers who were reviewing a translation of the New Testament in the Sindhi language. In our study of the Sermon on the Mount we found a number of places where section headings actually detracted from the flow of the passage and obscured the meaning…. As full disclosure, I should confess that I’ve been a fan of Willow Creek before Willow Ceek was Willow Creek. In the mid-1970’s the youth pastor of my home church in Park Ridge, Illinois was a Trinity College student named Bill Hybels. I always enjoyed coming home on holidays from Seminary just to see what was happening with Bill and the youth group at South Park Church. In the vocabulary of the ‘70’s, it was a “happening!” High School kids were showing up by the carload, each week more than the last. When I heard one of the elderly people complain, it was the first time I heard a phrase that has since become an evangelical mantra: we are just being sensitive to the seeker. The term “seeker-sensitive” has become so much the standard for evangelical style that I was a bit shocked to read the recent confession from Willow Creek reported by Bob Burney in the Baptist Press [November 6, 2007.] As the result of a multi-year study on the effectiveness of their philosophy of ministry, the Willow Creek leaders discovered that while they have reached large numbers of people, they have not been producing solid disciples of Jesus Christ. It’s a remarkable moment. And I can’t help but think that we may begin to hear another term added to our vocabulary next to “seeker-sensitive” … “self-feeder.” It will be fascinating to see what that will begin to mean. This entry was posted in Church and tagged Bible, Church, Cross, Jesus, Leaders, Ministry, Seminary on December 3, 2007 by Lyle Schrag D.Min..
My wife, Karen, heard a message by a young woman with no theological training on Jer 29:11, “I know the plans I have for you….” The young woman spoke of the verse as if it was addressed to us today and talked about the plans God has for us. Although God has revealed his will for us as human beings in his word, this was a misapplication of the verse because God was not speaking to us in this verse, he was speaking to another people in a different historical time and place; we are not part of those particular plans. A better, and common, approach is to recognize that while the verse is a promise to people of another age, we can still ask, “What lesson can we learn from this that is applicable to us?” That is, even though the words are not written to us, the message is still, in some less direct sense, for us. The latter approach is based on the conviction that there is something grander in the Bible than chapter and verse application to the way we live: it is the vision, the revelation of God himself. The primary purpose of the written word is not to give us instructions on how to live, but to be a witness to the Living Word who in turn reveals to us the nature and heart of God. It is within that broader perspective of discovering God that we become shaped into the image of Christ and respond in worship. During the time we lived in Larkana, Pakistan, Benazir Bhutto became prime minister of Pakistan. Since Larkana was her family home town, there were some obvious perks. One of the most obvious was the construction of several fountains at key intersections. Each fountain had a plaque proclaiming the name of the patron who had funded the project. At the same time, the sewage system in Larkana was obviously insufficient for the population and in many places, nonexistent. In terms of improving people’s lives and preventing disease, a sewage system was logically a far more practical choice, but that did not seem to be a major concern. Karen and I would often comment on a probable reason for this priority: To have one’s name on a fountain was an expression of honor, but there was no equivalent avenue for self-glorification in improving a sewage system. Who wants their name attached to sewage pipe? As Christians our perspective needs to be very different. We are followers of a savior who chose the “sewage pipe” way to serve, rather than the self-glorification of “fountain” construction. He sacrificed for what we need – redemption from the sewage of our lives – which resulted in the shame of the cross rather than the glory of the throne that the disciples were hoping for. Sometimes ministry feels like constructing sewage pipes without anyone praising our efforts. But that may be a good indication that we are following Christ. The world strives to put their name on the “fountains,” servants of Christ work on the sewers. At the present time, the fountains in Larkana do not have any water flowing in them and they have become receptacles for garbage. I think there may be a lesson in that as well. "if you don’t know what an alpha release is, don’t use this software!!" I love the concept of free web software – a web application that has been designed by someone out there in cyberland who has put it up on the net to be downloaded and used freely (donations always appreciated). It is in this context that I have chuckled in the past couple of days as I have been searching for some very specific plugins (small web applications) for WordPress (the web software on which this site runs). In the process I have come across several websites that describe their particular plugin as an "alpha release" – with the following warning- "if you don’t know what an alpha release is, don’t use this software!!" Warning heeded!! It is common for web software programmers to release a version of the software they are developing to the public – a version that is not fully tested or does not have complete functionality – in order to give the internet community an opportunity get a sneak preview or even to help in the debugging of the program. In this way users will often help with suggestions as to what additional functionality might be added to the software in order to make it a useful tool. These releases are labeled "alpha" or "beta" versions and if the software is deemed to be almost complete, "release candidate 1 or 2" (RC1, etc.). I have occasionally experimented with web software that was still in the "beta" stage. Sometimes, however, it is frustrating when I am looking at a piece of software that is advertised to do just what I want it to do – but it is still "beta"! Do I dare use it on my "precious" website? Can I trust it? Other times it is quite annoying when software touted as the ultimate answer for a particular need does not live up to its promise. But that is the world of software offered on the web and those are the risks you take when you use a "beta" version. Today is Canadian Thanksgiving Day and I was reflecting on what I had to be thankful about and thinking about some of the experiences I have had with "beta releases" it occurred to me that when Jesus provided the "Ultimate Answer" to mankind’s deepest need he provided the only and final release, free and absolutely complete! Jesus…prepared for every contingency, every possibility, every condition and every era. He did not take any shortcuts or half measures and did not leave any functionality out. When Jesus provided salvation for us He prepared for every contingency, every possibility, every condition and every era. He did not take any shortcuts or half measures and did not leave any functionality out. He did not forget anything or ignore anything. He knew every need we would ever possibly have and provided for them all. When He died on the Cross to save mankind from sin he did not take a trial and error approach – he went all the way and did it perfectly – first time! His "plan" for us has never needed debugging, security updates, patches or fixes. It is perfect, there will never be any other versions or releases – and it is free for the receiving! In fact donations are not even possible and to attempt payment nullifies the "plan". So, to recap! The salvation Jesus has provided is absolutely perfect, absolutely complete, absolutely efficacious, absolutely trustworthy and absolutely free. Now that is something for which I can be very thankful – and so can you!. In the realm of web software I will continue to experiment with the occasional "beta" release. In the spiritual realm, however, I have settled on Jesus’ perfect "plan"- His provision for eternal salvation. I heard Jeff Arthurs from Gordon-Conwell Theological Seminary read this little parable at an Evangelical Homiletics Society gathering many years ago. Afterwards I asked him for a copy so that I could share it with my classes. It was published in 1919 by William Eleazar Barton, otherwise known as “Safed the Sage”. The piece has been edited. My job is like unto the crossing-tenders for my job has the same trials. Nevertheless, his is a good job, and so is mine. And every now and then we keep people on the right side of the gate. So I considered this, and I resolved to do it as well as I could. This entry was posted in Evangelism, Preaching and tagged Cross, Seminary on October 1, 2007 by Kent Anderson Ph.D.. So, how have you seen short-termers transformed into long-termers? I’m thinking of good examples in which sharp people end up in significant, well-fitting roles. I’m imagining non-manipulative methods in which people are invited to recognize their gifts, are provided with proper stepping stones to long-term commitment, and are shepherded into a successful cross-cultural career. This is an excellent question and one that a lot of missions agencies (including Fellowship International Ministries) have discussed often. If you have any ideas or experience in this, please let me know. Do you know someone who went from short term missions to career missions? If so, how did that transition occur? Can we discover a pattern or a means for greater impact that would encourage people towards a long term investment in international ministry? If you have any ideas, drop me a line via the form below. One concern that I have is that the strong cultural emphasis on individualism in our churches mitigates against the possibility of a communal decision to appoint someone to missions. We have personal decisions, a personal walk with Christ, personal devotions and a personal calling to ministry. When pastors decide to move on they make a personal decision and then involve the church in the process. All major decisions are personal, and while professional advice is often sought, communal involvement in personal decision making (job, spouse, education, etc.) is unusual. I am not opposed to this system; it is a reflection of our cultural orientation and comfort zone because, as Canadians, we are quite reserved about having direct involvement in those aspects of other people’s lives considered "personal". However, the downside of this is the reticence we have to provide others with direction and insight for a calling into cross-cultural ministry. As churches we give general invitations, but rarely identify individuals as capable of international service and challenge them in that direction. Perhaps this lack of input in people’s lives keeps them unaware of their potential to serve God in missions. The general sense in that anyone can go on a STM trip, but in our context it feels presumptuous to take the initiative in proposing a career in missions for someone else. Do you agree with this assessment or are there other, more important factors? Have you ever been bemused by God’s way of doing things? I have, and in the end have stood in awe of His timing, patience, grace and goodness. A number of years ago (in another world) I taught at a Bible college deep in the jungles of Kalimantan (formerly known as Borneo). For several years I had a student who was a source of great consternation to me. It seemed that no matter what subject I had him for he just could not "get it"! His academic situation came up repeatedly in our faculty meetings but no one had the heart to say, "Sorry, he just isn’t making it – let him go!" So from year to year we granted him a provisional pass to the next level of study and every year we wondered. But he kept pressing on. Everyone loved him. His gentleness, humility and transparency captivated all who knew him. I was responsible for student accounts at the time and one day he came to my office to ask for some money from his account. I had just reviewed the books and his account was more than empty, so I asked him, "On what basis are you asking me this?" (literal translation). He pulled himself up straight and declared, "On the basis of the grace of God!" I could hardly contain myself and found some extra funds that we had for just such an occasion – grace funds! Total dependence on the grace of God seemed to be the theme of his life. In his fourth and final year I was assigned to be his practicum supervisor and evaluator. He was pastoring a church in a nearby village and I went with him several Sundays to evaluate. I had taught him homiletics but his sermons bore no resemblance to anything we had studied. I was seriously considering recommending to the school that he was not cut out for the ministry. However, after the services I went with him as he walked from home to home in that village, praying for people, encouraging them to be strong in their faith, counselling, advising and loving – and the people loved him in return. The church in that village had never been so healthy and vigorous. We graduated him that year (with no little sense of misgiving) and that was the last I saw of him for 14 years as my wife and I were denied extensions to our visas and returned to Canada that summer. In the intervening years we have often wondered. I had the privilege this summer of returning to Kalimantan and visiting in this same young man’s home and witnessing the amazing grace of God. He is married with three children. He and his wife are involved together in a marvelous cross-cultural ministry. As we spoke I learned that he has already planted a church amongst a very difficult people group. He has turned that church over to another man to continue the pastoral work and is now in the process of building a second work which involves not just a church plant but also a Christian school as well – again, in the midst of a most difficult ethnic group. It defies human explanation. Oh, the wonderful grace of Jesus! God’s economy is one of utter grace. This entry was posted in Godliness, Gospel, Grace and tagged Bible, Church, Cross, God, Jesus, Ministry, Seminary, Translation on August 27, 2007 by Loren Warkentin M.T.S.. In The Search to Belong: Rethinking Intimacy, Community, and Small Groups (Grand Rapids: Zondervan, 2003), Joseph R. Myers challenges evangelicals to think creatively about how people belong. He utilizes the work done by Edward Hall explaining that there are four â€œspacesâ€ or levels of connecting in which people relate and commit: Public, Social, Personal and Intimate. He makes the observation that churches largely function on the â€œpublicâ€ and â€œintimateâ€ levels with the goal of involving all attendees in the â€œintimateâ€ space of small groups. He then suggests a different approach in which the church legitimizes relationships in all four spaces without attempting to move people to spaces where they are uncomfortable. If I understand Myers correctly, in public spaces we interact indirectly with and through others. For example, a worship service, a Bible study or the crowd watching a sports event would be a public space. In such contexts we deal with other people indirectly centered on a common interest. In this space there is little vulnerability. In social spaces we relate our stories to others and hear their stories. This is a sharing of history, experiences and relationships that does not require privacy. Such sharing is an invitation into someone elseâ€™s life at a limited and comfortable level of vulnerability. In personal spaces we share our private hopes and dreams to a few special people. This involves a partnership or commitment towards togetherness and connection. Communication is deeper than merely verbal. Acceptance of others occurs in spite of knowledge of personal shortcomings, which implies a deeper level of vulnerability. In our intimate spaces we connect deeply and openly. We are â€œnaked and not ashamedâ€. More than simply physical nearness, this includes vulnerability to the point that betrayal would result in lasting wounds. Jesus was absolutely committed to doing the Father’s will. His life was marked by obedience. That is a good starting point for the pursuit of godliness – obedience to the revealed will of God. The corollary there is that obedience requires knowledge – which leads us to the importance of diligent study of His Word (we cannot obey if we are unfamiliar with His desires). Jesus was completely dependent upon the Spirit’s enabling. He spent much time in prayer. As I read the stories of godly men and women of the past and of today prayerfulness is a recurring theme. Jesus loved others. He reached out to the outcasts of society — the unloved and forsaken and gave them hope. We will grow in godliness as we grow in loving one another. Jesus commanded this of his followers and said that they would be known as his followers by this very characteristic. Jesus proclaimed the Good News wherever He went. He has commanded us to do the same. Why don’t you share a few thoughts on this website? In what ways have you been following Jesus? What "good works" do Christians today need to be focusing on? Has someone encouraged you in your walk of faith – challenged you to keep pressing on? My wife and I were discussing this article and she was quick to point out that mine was not the last word on the topic of godliness. So, let’s continue the conversation and as I enjoined us in my first article on this topic, let’s continue to encourage one another to keep pressing on. Here are some conversational threads that I see in the Scripture passages mentioned above. I’ll not stray from the course called ‘straight’! My goal? Toward the mark I press! The mark? The prize of God in Christ! When winning Him, I’m found in Christ. 1Scriptures quoted from The Holy Bible, English Standard Version®, copyright ©2001 by Crossway Bibles, a publishing ministry of Good News Publishers. ESV Text Edition: 2007 (emphases mine). This entry was posted in Godliness and tagged Bible, Cross, God, Jesus, Ministry, Prayer, Scripture on June 27, 2007 by Loren Warkentin M.T.S..
My wife, Karen, and I belong to a Bible study connected with our church with participants who are extremely diverse in their Christian faith. One person saw God as a finite being who came into existence at the Big Bang. Another refers to himself as a “lapsed Catholic” who views God as an impersonal force. A third comes from an atheistic background, but with the conviction that there is a spiritual reality that we need to connect to. Of those with an evangelical faith, some have a modernist mindset (“Start with the historical facts and build your life on that”), while others have a post-modern perspective (“I do not have the capacity to be certain. I will believe and trust”). What we have in common is an admiration for Jesus and the hope that he can guide us into a significant and life giving connection with God.
. . . how can we function within this fluid dynamic to build significant relationships that bring people closer to Christ? This Spring one of the participants – the “lapsed Catholic” – presented us with the challenge to read the first 6 chapters of Mark as if we had never read them before and did not know about Jesus. We would then share what we understood and experienced with each other. This has led to significant, enlightening and, at times, not altogether comfortable, observations about Jesus. The one with the atheistic background at one point exclaimed that Jesus appeared to be an “arrogant and crazy prophet”! This, however, in the minds of some of us, represented progress past the rather stifling view of Christ as a moral teacher. I present this small group as an example of how people “belong” in our Canadian context. Although some of the group are not qualified to be “members” of the church, all the participants see their connection to the church as significant. None of them are seeking to change their commitment to the church, yet all are involved in developing their understanding and commitment to Christ within one expression of the church. In our Canadian society people are very comfortable to belong to a church with differing levels of commitment (from dedicated member to casual participant) and within a variety of expressions (small groups, worship services or special programs) chosen to meet their current felt needs. With my missionary mindset of exploring ways to make the gospel relevant to specific contexts, I find this intriguing and educational. Rather than motivating people to pledge a long-term commitment to a particular ideal of membership, how can we function within this fluid dynamic to build significant relationships that bring people closer to Christ? In such a context, boundaries and definitions of who is “in” and who is “out” become less important than the direction people are moving in. How do people belong? This is an important issue in missions, particularly for a church planting mission such as Fellowship International Ministries: What does it mean to belong to a church? There are many different ways to express and value belonging, and these vary from culture to culture. A college student from Azerbaijan informed me recently that “Canadians are very friendly, but they don’t want to be friends!” In other words, the level of belonging and the expressions of that belonging she was used to in her own culture, were very different in Canada. She expected friendliness to lead to a more intimate relationship, but quickly realized that she was imposing on boundaries they wanted to maintain. While in Pakistan my wife, Karen, and I had similar experiences. Our concept of ‘friendship’ was different from the expectations in Pakistan. To be invited into a home as a couple to sit with both men and women indicates a level of ongoing commitment that we, as Canadians, reserve for our immediate families! So what about church relationships? When planting a church, what is the expectation of commitment? One person may view the community in terms of family loyalty, while another may see this particular interaction with other believers as only one avenue of relationships among many, without the need for deeper commitment. Some may consider the church activities as central to their Christian development. Others may be content to participate at one level (e.g., attendance at worship, small group, worship team), while finding fulfillment for other needs (e.g., teaching, guidance, fellowship) in venues outside of one local church. Should church planters seek to bring all people to a particular level of commitment that fits with one cultural model of church, or should they adjust their expectations to the realities of the connections that people prefer for themselves? If the goal is to help people develop their commitment to Christ within the level of commitment and relationships that they believe are important, then what will Christian community look like? Last week I held my grandson in my arms for the first time. My heart was lifted up to my heavenly Father in adoration and praise as I gazed down on that tiny, frail, absolutely dependent, but intricately and beautifully formed bit of humanity. I could not help but ponder the fact that in this small child was another reminder of how the Eternal God gave us His ultimate revelation of Himself. This was how Jesus came. What incredible humility, what awesome condescension, what amazing love â€“ that He, the creator and sustainer of all should have taken on this humanity, this utter dependence. My mind struggled with the incomprehensibility of the truths ascribed to Him in the accolade of Colossians 1:15-20. Did He, the One who holds all things together, constrain Himself to the confines of the likes of this newborn infant, who was so totally dependent on my capability to hold him safely? I gazed down at my grandson and watched as his miniature hands and feet flailed and his tiny fingers grasped my thumb reflexively but with no ability to do anything other than to convey the sense of utter helplessness. What wonder is wrapped up in the mystery of the incarnation! Did Jesus come like this? Only a mighty, loving and gracious God could have planned this! Holding that babe in my arms and pondering the next few words of that glorious hymn from the pen of the Apostle Paul created strong stirrings of adoration and thanksgiving in my heart. Thank you Eternal Father for sending your Son, Jesus. Thank you Loving Father for sending this little grandson! Through him you have reminded me of your awesome love and compassion – of your audacious plan for our redemption. Is it just me or has the concept of â€œbelongingâ€ to a church become more fluid lately? I remember growing up in a churched context and it was very obvious who was â€œinâ€ and who was â€œoutâ€. Membership was an important concept and there was a sense that unless a person became a â€œmember,â€ their relationship with God and other believers was not as it should be. Each local church, even if its building was located across the street from another similar church, encouraged a deep level of commitment to their particular communal expression of â€œchurchâ€. Of course, I grew up in a church planterâ€™s home, so that understanding may not reflect the perspective of the average person in the pew. …it seems that belonging for evangelical believers today has more to do with significant connections with other Christians, than with a commitment or loyalty to one specific expression of Christian community. However, today, unless it is only my own perception, that view seems to have morphed into a more flexible and complex understanding of belonging. Perhaps it is partly due to the western emphasis on individual rights and responsibilities. Perhaps there is greater tolerance of diverse theological views. Perhaps the perceived need of â€œa church experienceâ€ has changed. Perhaps it is due to the many opportunities that people have to belong to a variety of expressions of Christian community through the radio, TV, small groups, â€œparachurchâ€ organizations, missions teams, concerts, etc. Whatever the reason, or combination of reasons, it seems that belonging for evangelical believers today has more to do with significant connections with other Christians, than with a commitment or loyalty to one specific expression of Christian community. As someone who has a missionary mindset, I seek to understand and conform to cultural trends in order to present faith in Christ in a relevant way. Such a change (if I am correct) is neither to be rejected nor unquestioningly embraced. Instead, the question is, what does relevant and impacting Christian community look like in such an environment? This entry was posted in Church, Missiology and tagged Church, Cross, God, Missions, Seminary on May 21, 2007 by Mark. Just what is a church missions team expected to do? Because of the way church missions has developed in recent years this question has become increasingly important for those who desire to be effective mission mobilizers. In some churches the missions committee’s primary role consists of passing on the prayer letters of missionaries to the congregation. However, other church missions teams are playing a far more complex and influential role. This is evident in the “Design your Impact” workshops1, in which the role of the missions team is presented as shaping and overseeing the overall missions purpose and strategy of the church, both locally and globally. In addition, the rise of short term missions can make the duties of missions teams quite demanding, often requiring the services of a full time missions pastor. … the role of the missions team and the parameters within which it is called to function must be clearly defined. Unfulfilled expectations and a lack of clarity concerning the vision and responsibilities of the missions team quickly undermines its effectiveness. During my interviews with pastors and key missions committee personnel for the purpose of discovering ways church missions can be improved, one pastor shared the parameters that he uses to define the role of the missions team within his church: The missions team is responsible to facilitate all outreach partnerships outside of the local church’s programs. In this perspective short term mission teams or local evangelistic efforts – intra-cultural or cross-cultural – are not the responsibility of the missions committee. Instead, their role is to monitor and facilitate the partnerships of the church with those missionaries and other workers who have a primary responsibility to another organization (such as a missions agency). Whether or not this is the position taken by a church is of secondary concern. What is obvious is that the role of the missions team and the parameters within which it is called to function must be clearly defined. Unfulfilled expectations and a lack of clarity concerning the vision and responsibilities of the missions team quickly undermines its effectiveness. Coming this fall a “Best Practices for Church Missions” workshop will be offered to assist church missions committees as they define their role and purpose within the broader vision of the church. Let me know if you are interested. Have you discovered some creative ways to highlight missions in your church? Send those ideas to me via the form below so that they can be shared with other churches. Visit the Best Practices for Church Missions webpage and evaluate your church’s missions team. 1. Developed by DualReach, see www.dualreach.org/missions. This entry was posted in Missiology and tagged Church, Cross, Missions, Prayer, Seminary on May 10, 2007 by Mark. I said goodbye to my baby girl this week. Becky and I, along with a number of other friends and relatives saw her off from the Seattle airport in the wee hours of Monday morning as she and her team of 7 began their missions odyssey to Thailand. She is only 23 and from this dad’s perspective “far too young” to have committed herself to a three-year stint involving a year of language study and two years of church related ministry in the Golden Triangle area of Northern Thailand. Ever since she returned from that first journey to Thailand we knew this day was coming. We had seen it in her eyes, heard it in virtually every conversation. My daughter had lost her heart to her God and to the people of Thailand – and we were delighted. But that did not change the things that were happening to my heart on Monday. The drive home from the airport was a blur. Fortunately my friend Jon had been tasked with the responsibility of keeping me awake so that I would get us home safely – at which he did a superb job. After an all-too-short sleep, morning came, and with it an odd mixture of thoughts and emotions. I found myself thinking that she was just in the other room. I would walk into the kitchen and half expect to still see her sitting cross-legged on the floor next to the fire place working on her computer or reading a book. When the front door would open my ears half expected to hear her cheery “Hi! I’m home!” It’s not as though she had never been away from home before. At 19 she did a year in Europe and at 21 she spent 9 months in Thailand. But somehow this was different. She had made a specific commitment of time to serve as a “full-time missionary”. Ever since she returned from that first journey to Thailand we knew this day was coming. We had seen it in her eyes, heard it in virtually every conversation. My daughter had lost her heart to her God and to the people of Thailand – and we were delighted. But that did not change the things that were happening to my heart on Monday. In the intervening year, since she had returned from Thailand, we enjoyed a delightful time of getting to know our youngest as she lived at home while preparing herself for this adventure. The three of us shared many delightful evenings together and both Becky and I felt that we got to know our daughter in a whole new way. We took in movies together. We enjoyed meals together along with many cups of coffee. We debriefed the joys and struggles of our days together. We teased each other and grew in love and respect for one another. Now she was gone and a corner of my heart was gone too – I believe it followed her to Thailand. There is another emotion in my heart – deep gratitude to my Heavenly Father. I remember a time when Becky and I wondered and worried what would ever become of our willful youngest child. But God, in His boundless mercy, got hold of that will (and of her heart) and she surrendered her life to Him. Now she was on an adventure with Him – following her Lord where ever He might lead. So we celebrated her departure. There were no regrets. At some point last week we all had a chuckle together as we realized that we probably would not shed any tears at the airport – that is just not how we do it in our family. We might shed them later, privately! But even those tears are not tears of grief over missed opportunities or unfinished business or unforgiven grievances. We were able to see her off with no regrets! We are just plain and simply going to miss her. As I pondered these conflicting emotions in my heart I paused to ask, “I wonder what happened in the heart of the Father when he sent His Son on the ultimate missions trip?” Is it in any way possible for me as a human dad to comprehend the heart of the Heavenly Father? I took a few moments to considered the depths that lie behind the statement “For God so loved that he gave …” (John 3:16) This experience has made me appreciate Galatians 4:4 a little more. “In the fullness of time, God sent his Son …” There is an unfathomable vastness to those simple words. The Eternal Son, who throughout that eternity had never left the Father’s side (John 1:18), was now stepping into time and space and into the human experience to undertake the greatest missionary adventure of all as He “…came to seek and to save the lost.” (Luke 19:10) It is comforting to know that my daughter is following in His footsteps. This entry was posted in Missiology and tagged Church, Cross, God, Jesus, Ministry, Missions on May 9, 2007 by Loren Warkentin M.T.S..
What is culture? There is a current debate (National Post, March 2-, 2007) about whether fashion should be classified as culture, with implications for government funding. Canada has policies promoting “multiculturalism.” I have read books and heard sermons concerning the need for Christians to remain separate from “the prevailing culture.” These diverse nuances of the term have resulted in confusion concerning the meaning of “culture” for the cross-cultural minister of the gospel. From an anthropological perspective, which is the primary way the term is used in missiology, culture refers to the relationship that the members of a particular ethnic group have with their environment and each other. This includes all aspects of life that provide meaning for that people group such as legends, laws, priorities, structures (material, organizational or conceptual), customs and artifacts. Worldview, on the other hand, refers to the conceptual framework or beliefs about reality from which cultural items gain their significance. There are universals common to all cultures (although there is no agreed upon list of these universals), but it is the differences between cultures that provide cultural identity and are the cause of much perplexity and conflict between people groups. This is the reason why the politically correct program of multiculturalism in Canada is so difficult. As a philosophy of accommodation so that cultures can co-exist while maintaining their separate identities, multiculturalism is predicated upon an assumption that there are sufficient agreed upon commonalities for such a project to succeed. However, not only are there disagreements about the identification of these commonalities, but even when they are identified at a theoretical level, the practical outworking of these values is elusive. For example, western “universals” such as “free speech,” “equal rights,” and the “rule of law” are understood and prioritized in fundamentally different ways in other parts of the world. As a humorous illustration of how cultures conceptualize reality in different ways, consider the following imaginary sports analogy: The country is Canada. The city, Hockeytown – a city in which only one sport, hockey, has ever been played. It is the only sport that has ever been imagined by the residents. To them hockey is not just one of many sports, but is what defines sport. Bobb Yorr has just returned from a visit to another city in which he was introduced to the sport of Tennis. Grett Ski has never been out of his city and so, for him, “sports” is defined by ice rinks, hockey sticks and hockey nets. Grett: Hey, Bobb, long time no see! What have you been up to? Bobb: I’ve just got back and I’ve discovered another sport. Grett: Another sport? What do you mean – another way to play hockey? Bobb: Um, well it’s a sport like hockey is a sport, but totally different. Grett: How can it be like hockey and totally different. That doesn’t make sense. Do the teams line up differently or something? Bobb: Well there are only 2 players. Grett: What! Only two players on the whole team? How do they take shifts? Bobb: No, only two people in the game, one player on each team and they play the whole game. It has been interesting for me to think about spiritual formation from a different perspective spending these days in Rome. I suppose that when I arrived here I was prepared for the Coliseum, the Forum and all the vestiges of Imperial Rome. I was less prepared for the influence of the Roman Catholic experience. It has been interesting to ride buses and walk the streets in close proximity with nuns, monks, and priests. Yesterday, my wife and I entered at least eight different cathedrals, all stunning in their beauty and complexity. Today we walked down Catherine of Sienna street. A few impressions… On Saturday we managed to get tickets (free – but nonetheless rare) for the Pascal Vigil which is a three-hour service beginning at 10pm. This was pre-resurrection worship in anticipation of what would happen the following morning. We sat a few dozen feet from the alter inside the vast St. Peter’s Basilica, the very seat of Roman Pontifical power, and just a few dozen feet from the Pope himself. Once we were able to get past the stunning beauty and scale of our surroundings, we were able to settle in and try to understand what was happening. Given that about 90% of the proceedings were either in Latin or Italian, this was difficult. Still, we were able to sense something of the wonder that Catholics bring to the experience of celebrating the death and resurrection of our Lord. I remembered how just a few days earlier, I had led communion in a small evangelical Baptist church in Hope, BC. It seemed worlds apart. While I loved the sincerity and meaning of that small protestant service, I found myself feeling that our celebration was a little weak in comparison to all the drama we experienced at St. Peter’s. Karen and I did not go forward to receive the mass, perhaps in solidarity with our free church reformation protestant forebears who would have been aghast that we were there at all. I’ve got some huge issues with the Catholic church. The veneration of Mary, prayers for the dead, and the general misuse of money and power so in evidence throughout this city, leave me cold. Still, these people love Jesus. This afternoon we looked at paintings by Raphael and Caravaggio, not to mention Michelangelo’s magnificent ceiling in the Sistine Chapel. I want to tell you that it was as much a worship experience as a tourist experience for me. Yesterday, we visited the catacombs and thought about the tremendous faith practiced by the early Roman Christians. We visited the prison where Peter and Paul were incarcerated and stood inside a cell that may very well have been their own. I was deeply moved to think about how our faith is not some mythological story about gods that never actually lived. Our faith is rooted in real history and it has changed the world. In the afternoon we stumbled across a chapel in the Lateran section of town where was housed the Scala Sancta. Tradition holds that these were the actual stairs that Jesus used when he climbed to meet with Pilate to be judged. The stairs were said to have been brought to Rome by Constantine’s mother, Helena. While this cannot be proved, the possibility is plausible as these were real people and real places. Whether or not the stairs really were as reputed, I was moved by the devotion of people who climb the stairs one by one on their knees. 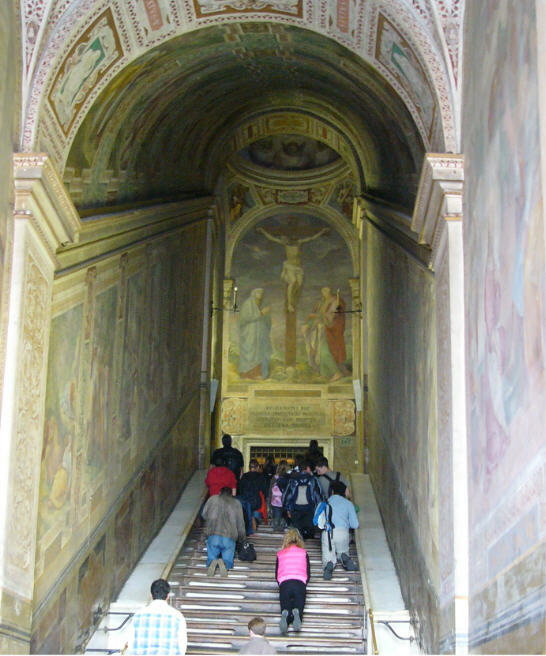 The sides of the staircase are adorned with frescoes (mural paintings) depicting the passion of Christ. I watched these people kneeling on each step individually to think about the pictures and to offer prayer to God. Say what you will about the possibility of their superstition, but rightly directed I could see how this could be a powerful worship experience. I guess I was too Baptist to participate, but I did pause to thank my God for his sacrifice for me. On Easter Sunday morning we stood in St. Peter’s square (it’s actually round) with at least 100,000 of our closest friends. The Pope’s sermon (what we could gather of it) spoke about resurrection and hope. He denounced terrorism and the war in the middle east. I’ll never be a Roman Catholic, but standing in that place filled with hopeful people, seeing people wave their flags from every corner of the world (including more than a few Canadian flags), I thought about the old Sunday school song we used to sing… "Red and yellow, black and white. All are precious in his sight." This entry was posted in Easter and tagged Church, Cross, God, Jesus, Prayer on April 25, 2007 by Kent Anderson Ph.D.. I have always found the thoughts and writings of George Bullard to stimulate my thinking. Not long ago, I came across a phrase from his online journal [http://bullardjournal.blogs.com/bullardjournal]. In reporting on a workshop at the Lake Hickory Learning Community on Sustaining Pastoral Excellence, Bullard described a phrase used by Alex McManus that “mobilization is the new assimilation.” I love a good turn of phrase. Mobilization is the new assimilation… As Bullard caught the phrase, his understanding was that mobilizing people in the work of the kingdom of God…is the best way to assimilate them into the body life of a local congregation. When the new “unchurched Harry” comes to church, they want to be involved in something with someone….If anything,… [to] get a measure of the quality of people’s lives through actual experience … are these people authentic, are they real, do they believe what they say, and how do they really feel about me…? Bullard’s interpretation of the phrase took me back to a conversation that I had with one of my dear friends who is part of the leadership structure at the Willowcreek Community Church. According to him, there has been a huge shift in their approach to non-believers. The “Seeker” of the ‘80’s and ‘90’s” described as “unchurched Harry” valued anonymity, and Willowcreek honored that value by creating a safe space around those people who were “coming to God, but weren’t aware of it quite yet.” According to my friend, things have undergone a remarkable change in the last 7 years. “Seekers” no longer value anonymity as much as they now demand participation. When the new “unchurched Harry” comes to church, they want to be involved in something with someone – not so much for the long term, but in a limited fashion. My friend told me that it’s more than just a matter of finding a community and finally gaining a sense of belonging. If anything, this new demand is being made so that the Seeker can get a measure of the quality of people’s lives through actual experience … are these people authentic, are they real, do they believe what they say, and how do they really feel about me as a trusted partner? As a result, Willowcreek has had to shift their approach to the Seeker from anonymity to partnership and have discovered that mobilization is the new assimilation. It’s not been easy. They have to find appropriate ways to include the seeker into the action. They can’t very well make a seeker a Sunday-school teacher … but they are finding valuable roles for seekers to do 2 things: 1. make an impact with the seeker’s service [even if it’s helping with the parking lot managers] and 2. provide an authentic opportunity for the believers to communicate faith and create community. As I travel in our Fellowship, I find myself thinking – that would be both a challenge and an opportunity for our congregations … to think about how to make Mobilization a matter of Assimilation. This entry was posted in Leadership and tagged Church, Cross, God, Leaders, Leadership on April 20, 2007 by Lyle Schrag D.Min..
People committed to supporting cross-cultural missions, whether locally or globally, recognize the essential role of missionaries who have dedicated years to learn the culture and language of a particular people group. It is through their expertise that bridges for the gospel are discovered and churches planted. However, missions mobilizers serving in churches are often frustrated and discouraged at the overwhelming task of keeping people interested and committed to the support of missionaries over the long haul. There are so many legitimate activities and alternative ministries that staying the course with one family whose ministry requires slow and steady progress, rather than glamorous leaps, is difficult. Support sometimes becomes reduced to a budget item that is “rubber-stamped” each year. As a result people no longer give to the church generally and think about their financial commitment to missions once a year. Instead, a focus on missions giving is highlighted weekly along with giving towards the church’s general needs. One church in our Fellowship has developed a creative approach to the support of their missionaries that, even though only a small adjustment, has helped provide a stronger focus for missions in the church. Each year they designate part of their budget to the support of their missionaries, as is common practice for most of our churches. However, funds from the general offering cannot be applied to this commitment. Only those funds designated “missions” are used to fulfill this responsibility. As a result people no longer give to the church generally and think about their financial commitment to missions once a year. Instead, a focus on missions giving is highlighted weekly along with giving towards the church’s general needs. Secondly, the deacon in charge of missions is responsible to keep the church informed of their commitment and when giving has fallen short, he or she reminds the church of the importance of these ministries and the role the church plays in advancing God’s mission. Furthermore, when giving exceeds the budgeted commitment, and this is not uncommon, they are able to apply these extra funds to special projects such as the Fellowship International Ministries 2007 “Blessing the Nations” project. Have you discovered some creative ways to highlight missions in your church? Send those ideas to me via the form below so that they can be shared with other churches. Visit the Best Practices for Church Missions webpage and evaluate your church’s missions team. We are working on a workshop to support churches as they seek to join in God’s mission both locally and around the world. Information on this will be posted on the Best Practices for Church Missions webpage as it comes available. This entry was posted in Missiology and tagged Church, Cross, Culture, God, Gospel, Ministry, Missions, Seminary on April 13, 2007 by Mark. At a recent seminar a pastor posed the question: “What is the difference between multi-ethnic and multi-cultural?” Ethnicity primarily refers to group identity arising from a common history, kinship and language. Culture refers to the way members of a particular ethnic group relate to their environment and each other. This includes legends, laws, priorities, structures, customs and artifacts. Multi-ethnic, therefore, refers to members of a variety of ethnic groups interacting within a particular forum (such as a multi-ethnic church). Such forums require a common structure or format with which all members agree to conform in order for this multi-ethnic interaction to function successfully (e.g., for multi-ethnic churches in Canada this is generally the church practice of the dominant Canadian culture). The hope is that churches will be able to clarify their own particular identity as they navigate the passage between multi-ethnic and multi-cultural that will result in healthy and liberating expressions of the church of Jesus Christ. Multi-cultural, on the other hand, is much more complex, harder to envision and fraught with conflict. The concept is that members of a variety of ethnic groups interact while maintaining their distinct cultural practices and priorities. In reality, this is a paradox because while cultures are defined by their distinctiveness, community and interaction rely upon commonalities to establish unity. In order to have intercultural relationships, some accommodation must be made on one or both sides of the cultural divide. But the act of accommodation represents, to some degree, a compromise and loss of cultural values. In my experience, most of our Fellowship churches that are multi-ethnic are not multi-cultural. These churches have embraced a number of ethnic groups within a culturally Canadian expression of church life. My article on setting an intercultural agenda for our churches in the recently published book by NBS, Being Church: Explorations in Christian Community, recounts a discussion of cultural issues with a Punjabi couple (p. 26). Although they attended a multi-ethnic local church, they expressed appreciation for the opportunity to occasionally attend a worship service with a mono-cultural Punjabi congregation some distance away. The attraction was the specifically Punjabi cultural elements such as singing the Psalms in Punjabi with traditional musical instruments. In order for them to participate in their multi-ethnic local church, they were required to relinquish much of their Punjabi heritage as it relates to church life. Our Cross-cultural Think Tank has prepared a seminar on cultural diversity designed to help our Fellowship churches work through the cultural tensions that arise within our multi-ethnic churches. The hope is that churches will be able to clarify their own particular identity as they navigate the passage between multi-ethnic and multi-cultural that will result in healthy and liberating expressions of the church of Jesus Christ. For further information contact Mark via the form below. The Tomb of Jesus – Empty or Still Occupied? Has all the hype surrounding the "documentary" film The Lost Tomb of Jesus caught you off guard? The film’s website proclaims, “An incredible archaeological discovery in Israel changes history and shocks the world.” Well, what about it? The website contains a "proviso" stating that they are not disputing the resurrection of Jesus. The film makers claim, “Even if Jesus were moved from one tomb to another, this does not negate the possibility that he was resurrected from the second tomb” and then add in relation to the ascension: “If Jesus’ mortal remains have indeed been found, this would contradict only the idea of a physical ascension. However, it says nothing against the possibility of a spiritual one nor does it dispute the idea of the Ascension.” The fact remains that, if it is true that Jesus’ bones are contained in an ossuary somewhere in present day Jerusalem, then Peter’s statement in Acts 2:22-24* "Men of Israel, listen to this: Jesus of Nazareth was a man accredited by God to you by miracles, wonders and signs, which God did among you through him, as you yourselves know. This man was handed over to you by God’s set purpose and foreknowledge; and you, with the help of wicked men, put him to death by nailing him to the cross. But God raised him from the dead, freeing him from the agony of death, because it was impossible for death to keep its hold on him." (emphasis added); and Paul’s declaration in Acts 13:34 "… God raised him from the dead, never to decay…", are nothing but empty lies! If, in fact, Jesus did not rise from the dead, victorious over sin and the curse, death and the grave, then in Paul’s words, we have believed in vain! But have we? What does the New Testament record tell us? Here is what Paul wrote to the church in the city of Corinth – countering the claims of some, who even in that day were disputing the possibility of the resurrection (1 Corinthians 15:1-25 – headings and emphasis added). This entry was posted in Easter, Resurrection and tagged Bible, Church, Cross, God, Gospel, Jesus, New Testament, Scripture, Theology on March 16, 2007 by Loren Warkentin M.T.S..
A friend of mine discovered that he was suffering from what he termed a spiritual "Stockholm syndrome", the phenomenon of kidnapped victims bonding with their captors as they look desperately for mercy or an act of kindness. In his previous evangelical faith a dark shadow of hell made my friend hungry for any indication of mercy and love from God. A believing friend was recently confronted by her son who said, "What kind of God would send people to hell just because they don’t believe in Jesus?" In a Bible study I attend one participant said that he wants to believe in a God who loves all people, but he has been brought up believing that the Bible teaches there are people God hates and who are chosen for hell. All of these perspectives are perversions of the clearest picture we have of God which is found in the Father of the Lord Jesus Christ: a Deity so determined that humanity would be redeemed to life that he suffered the indignity and pain of the cross in the person of his son rather than let us be destroyed. It is not eternal torment that is the essential truth of the universe, but the love of God. It is not hell that has the last word, but the Lord Jesus Christ who makes all things right and brings the whole universe back to God (Col 1:20). (Do not read between the lines here and label me a universalist: Jesus also taught that God does not forgive those who are unmerciful, uncaring and unrepentant ­ e.g., Matt 18 & 25). My concern is with the picture of God people are gaining from the gospel message. If our presentations of the gospel of Christ are being perceived as promoting arbitrariness, callousness and injustice on the part of God, then we are misrepresenting the salvation Christ offers. If people are hearing the love of God presented with a dark side of his satisfaction in the eternal torture of his creatures, then we are undermining the message of the cross. I am amazed at how many people exposed to evangelical messages of salvation are repulsed by the image of a God who doesn’t love the world, whose mercy is limited and who refuses to accept the meek and humble. Is there something wrong in the way we present the gospel that people fail to be confronted with the vast, unbounded grace of the Father longing to wrap his arms around the prodigal? What began this morning as a casual conversation has become a reflection that I just have to put into words. The subject of Community came up as Dr. Perkins mentioned his wonder of what sort of unifying symbols we have as Canadians that express our shared identity. Even more, what sort of unifying symbols do we have as Christians that allow us to recognize each other in the Canadian community. An image immediately came to mind. Last week my son and I had a chance to see the Coyotes play the Calgary Flames in Phoenix. In the parking lot we witnessed probably the most common unifying symbol of Canadian identity as a crowd of fans – all wearing Flames jerseys – discovered each other in the parking lot. By the time we were in the stadium, it was obvious that the Canadian “community” had arrived as more and more Flames fans were attracted by the gravitational pull of the jerseys. I must confess, even though I was determined to protect my interest as a Vancouver fan to cheer for a Coyote win against the hated Flames, my son and I found ourselves drawn to the Canadian crowd behind the Calgary bench as we watched the pre-game warmup. If there were a unifying Canadian symbol, it would have to have something to do with Hockey. But what about a similar symbol for the Christian community. Again, an image came to mind. The hockey game was on Thursday. On Wednesday my son and I had tickets to see the Phoenix Suns play the Boston Celtics. Different arena, different sport … but as we bumped our way into the stadium, I noticed another symbol. There was a large number of people in the crowd with smudges on their foreheads … Ash Wednesday, don’t you know. I must confess, there was a part of me that wanted a smudge on my forehead if for any other reason to be able to sense, in the crowd, that I – too – was one "of them." I realize that it’s not very Baptist of me to say it, but there is something quite compelling about the power of ritual and deep symbol. Maybe it’s part of this yearning for a tangible sense of identity and community that has animated a revival of interest in the “new Evangelicals” as named by Robert Webber toward ritual and orthodoxy. Back to this morning. As I returned to my office, I read an article by Nathan Bierma in the Christianity Today daily newsletter, The Shape of Faith. It was a review of two books, both of them historical studies of the ancient Christian practice of the sign of the cross: The Sign of the Cross: The Gesture, the Mystery, the History by Andreas Andreopoulos, and The Sign of the Cross: Recovering the Power of the Ancient Prayer by Bert Ghezzi. Again, I confess that I was fascinated by the study. As Bierma writes, Protestants have traditionally dismissed the act as “a Catholic thing.” But, the fact is that it has roots much deeper into the early church and practice that extend beyond the Reformation. In the Small Catechism, Martin Luther prescribed the practice because of the powerful potential for physical demonstration and the remembrance of deeper meanings. As Bierma writes, the faithful can treasure the multitude of meanings behind symbols. It is something that identifies community: the sign, as an act, small it may be, expresses the impetus of crossing the threshold between thinking in theological terms and practicing the Christian life. So, I linger on the question with a sense of wonder. How do we, as Baptists, create a sense of identity not just as a human community, but as members of a heavenly family? The locker room is an essential part of the culture of sport. It is an environment charged with team bonding, encouraging speeches and correcting rebukes, practical strategizing, the repair of both cuts and wounded egos, relief from the pressure of the game, the enjoyment of physical and mental refreshment, the adjustment and sharpening of equipment. It is important for the success of the team that it be kept clean and well organized. The atmosphere can cause a team to succeed or to fail. But what happens in the locker room is not the game. Neither the players nor the coach should be satisfied with good relationships in the locker room, even though only healthy cooperation will ensure success in the game. Both players and coach have a role to play on the field and it is the quality and function of the relationships on the field that guide the coach in shaping the activity in the locker room. The team is not judged on how they relate in the locker room, but how they perform in the heat of contest. The church organization – building, services, programs – is the locker room. The people are the players. Those in leadership play the role of the coach. The occupational hazard of the leadership is to engineer a clean, well-organized, enthusiastic locker room with excellent speeches explaining the rule book – and miss out on the essential aspect of coordinating the team’s effort to bring about gospel transformation. In the final analysis, the church will be judged not on the activity in the locker room, but on how they play the game of life, in the world. This entry was posted in Church and tagged Church, Cross, Culture, Gospel, Leaders, Leadership, Seminary on February 22, 2007 by Mark.